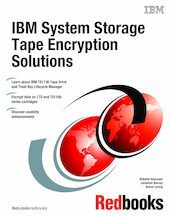 This IBM® Redbooks® publication gives a comprehensive overview of the IBM System Storage™ Tape Encryption solutions that started with the TS1120 Tape Drive in 2006 and have been made available in the TS7700 Virtualization Engine in early 2007. Also in 2007, the IBM Ultrium Linear Tape-Open (LTO) Generation 4 Tape Drive was announced including its support for tape data encryption. In 2008, additional enhancements to the tape drives that support encryption and to key management have been made. This edition of the book has been updated with information about the TS1130 Tape Drive and the IBM Tivoli® Key Lifecycle Manager (TKLM). This publication is intended for System Programmers, Storage Administrators, Hardware and Software Planners, and other IT personnel involved in planning, implementing, and operating IBM tape data encryption solutions, and anyone seeking details about tape encryption. This book also provides practical guidance for how to implement an enterprise-wide encryption solution. We describe the general concepts of encryption and the implementation options that are available when using IBM Tape to encrypt tape data. We explain the key management options, including the Encryption Key Manager, which is a Java™ application that allows for enterprise-wide keystores and key management across a wide variety of platforms. We also provide detailed information for planning, implementation, and operation of tape data encryption for IBM z/OS® and Open Systems hosts.